The Wylie School is home to the Voluntown Historical Society. Beginning in 2012, enjoy our local produce at the farmers market. Through this website the Voluntown EDC intends to promote Voluntown to prospective businesses and visitors, by highlighting what our town has to offer them. We hope the new website makes it easier for residents to access information on Voluntown EDC activities. The Voluntown Farmers’ Market, and Voluntown Methodist Church Project pages will be updated frequently. Check back often! The Voluntown EDC would like to highlight local businesses right here on this website. If you would like to nominate a business to be highlighted, please email us at edc@voluntown.gov . Highlighted business spots may include photos, description of services, introduction of owner(s), and a link to website and social media outlets. 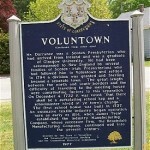 Please remember that www.Voluntown.biz is your tool. Any ideas that you have are greatly appreciated. If your business has an existing website, and you would like to have it linked to www.Voluntown.biz, please send us an email. Thank you in advance for your reply, and thank you for helping us support our town. EDC Special Meeting: How Can We Make Pachaug State Forest a Voluntown Desitnation? A Special Economic Development Commission meeting is being held on Saturday, February 16, at 10:00AM in Town Hall Meeting Room with special guest Mark Darren of DEEP. View the agenda here. How can we make Pachaug State Forest a Voluntown destination? This Saturday 2-16-19 Town Hall meeting room 10 AM. The Voluntown Economic Development Commission is currently seeking several new commissioners and alternates. If you are a Voluntown resident and want to help please forward your letter of interest to the Board of Selectmen. We meet every 3rd Thursday of the month at 5:30 in the Town Hall. We are pleased to welcome Mr. Mark Simmons as our fourth commissioner. The 2019 Voluntown Farmers’ Market grant has been submitted to Connecticut Department of Agriculture in November. We are hopeful we will be awarded our requested $8,459.00. The total project costs are estimated to be $15,173, with in-kind (EDC and volunteer hours) expenses of $ 5,450.00 and cash expenses of $ 1,264.00. Post cards (over 6,000 in our town and two neighboring towns), postage for the cards, handling charge for bulk rack card mailings. Referring to our Appendix B Budget this requested cost is estimated at $2,656 and our EDC Commissioner In-Kind match is $1,500. New Weekly Face book and periodic regional flyer Ad s. Referring to our Appendix B Budget is $495 requesting $315, our cash contribution of $60 plus In kind match of $125. road side sign New Banners, Advertising our Market Events and specials. Referring to our Appendix B Budget we request $400 with our In-Kind match of $400. Sunday Musician costs. Referring to our Appendix B Budget the cost is $1,125 we understand the DoAg will not consider contributing to this cost so our cash contribution is $1,125. WCTY Radio Ads. Referring to our Appendix B Budget, we are requesting $3,950 with a of In-Kind match of $2,480. Special Events-Bouncy House, Kids prizes, and on-site Opening Day live radio broadcast-`Roll’ N Radio Show’ (note $500 for this radio show is included in the WCTY request above and not duplicated here). Referring to our Appendix B Budget we are requesting $315, our cash contribution of $60 and In-Kind match of $120. Our Market necessary support costs include the rentals of one portable toilet and one 10’x20′ storage container for our picnic tables, benches, signage, banners, our booth table, tent, and chairs which we set up and store every Sunday next to the Market area. Referring to our Appendix B Budget we are requesting $320 for the portable toilet with a $300 In-Kind match., and request $590 for the storage container with our $500 In-Kind match. Changing our Farmers Market time to start at 10 AM and close 2 PM. Add more Village intersection signage. Do a better job of advanced advertising our special events Use social media & FB more. More patron seating & picnic tables. to increase both the number of patrons by 5%. to increase the number of Vendor sales by 5%. to increase both the number of vendors by 15%. Increase participation in the WIC Farmers Market Nutrition Program by 5%. We thank the volunteers who stepped forward and helped set-up, monitor, Facebook promote each Market, assist at the EDC booth, and take down equipment tents, chairs, benches tables for many of the 15 Market Sundays. We thank the Ct. Department of Agriculture again for their continued support in awarding us our requested grants. The EDC continues to promote Voluntown as an outdoor recreational tourist destination with our annual printing and distribution of the VOLUNTOWN TRAILS MAP, to surrounding camp grounds, motels, casinos, restaurants, at the Town Hall and Sundays at the Market. Help is needed with these ongoing projects. WE NEED TO FILL 1 FULL COMMISSIONER AND 2 ALTERNATE COMMISSIONER VACANCIES-PLEASE CONTACT THE TOWN HALL AND APPLY. EDC Commissioners: Jack Wesa, Tracey Hanson, Tali Soto and Mark Simmons. Starting in January, the EDC meetings will be starting at 5:30PM. Meetings are still hold on the 3rd Thursdays in Town Hall Meeting Room. The Economic Development Commission has 1 seated member vacancy, and 3 alternate member vacancies. The Economic Development Commission meets on the Third Thursday of every month (except July and August) at 5:30PM in Town Hall Meeting Room. The mission of the Voluntown Economic Development Commission is to foster economic development in Voluntown and increase the tax base by retaining existing businesses and helping them grow, encouraging indigenous business start-up, and recruiting light industry. 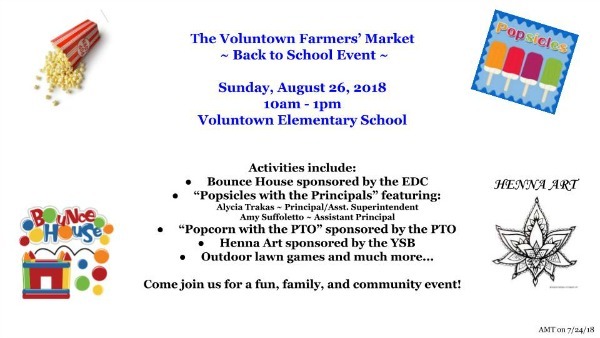 The Voluntown EDC currently sponsors the Voluntown Farmers’ Market. The EDC is working on several projects that promote Voluntown as an outdoor recreation tourist destination. Alternate members are needed to fill the seats of seated members when needed for a meeting quorum. For more information the Economic Development Commission, visit the EDC website and/or visit the next meeting on January 17 at 5:30PM in Town Hall Meeting Room. The Voluntown Economic Development Commission is planning a Voluntown Volunteers Day at the Voluntown Farmers’ Market on September 30th. If your Voluntown non profit group is seeking volunteers and would like to have a table at the market, please let us know by September 25. Email us at EDC@voluntown.gov. Thank you! The Voluntown Economic Development Commission is currently seeking Commissioners, Alternates, and Volunteers. The EDC meets the 3rd Thursday of each month at 6:30 in the Town Hall Meeting Room. The next meeting is Thursday, September 2oth. If you are a Voluntown Resident and would like to be a Commissioner or Alternate, please forward a letter of interest to the Board of Selectmen. Volunteers are needed to help with the planning, and running of the Voluntown Farmers’ Market. If we do not get any new Commissioners or Volunteers, we are at risk of losing the market for next season! The EDC is working on other projects to promote Voluntown as an outdoor recreation tourist destination. The EDC has also been working on how to present the town to businesses that are suitable to this area. Help is needed wtih all of these ongoing projects. 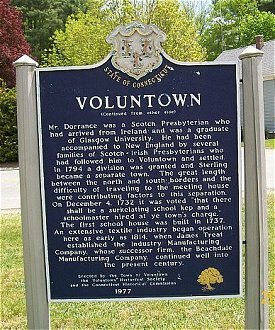 If you can not make meeting, but still can Volunteer, please send us an email at EDC@Voluntown.gov. The EDC meeting scheduled for Thursday, May 17 is cancelled. A Special Meeting of the Economic Development Commission will be held on Monday, May 21st at 6:30 PM. The Voluntown Economic Development Commission is currently seeking volunteers for help with ongoing projects. The EDC runs the Voluntown Farmers’ Market and is looking for volunteers to help set up, take down, and even help with planning the market. The EDC is currently working on projects to promote Voluntown as an outdoor recreational tourist destination. The EDC has also been reworking on how to present the town to businesses that are suitable to this area. Help is needed with all of these ongoing projects. The EDC meets on the 3rd Thursday of every month at 6:30 in the Town Hall meeting room. If you can not make a meeting, but would like to volunteer, please email us at EDC@voluntown.gov .